It’s 2017, and there is no reason to do everything by hand — not when there is an app (short for application) for almost everything. 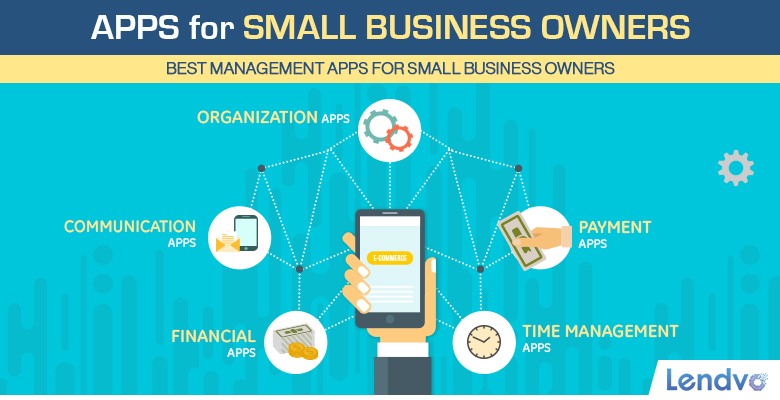 Running a small business is no exception; there are apps that can help you manage every aspect of your small business, from finance and accounting to time management to payment to overall organization. Yet with so many apps to choose from, it can be hard to know which ones are worth your time and your money. You may not want to devote the mental energy and effort to learning how to navigate an app when you are already juggling far too many responsibilities as a small business owner. That is why we have rounded up some of our favorite apps to help you manage your daily tasks with ease — or at least, with far more ease than you would if these apps weren’t in your life. We’ve broken the apps down by category so you can choose the type of app that you most need. If you have a strong payroll department and top notch accountants, you may not need a finance app — but you may need an app that helps you keep in touch with your employees. Scroll through to pick the apps that would benefit your business the month, and then click away to help maximize your efficiency and productivity. While you and most of your employees likely have smart phones, text messages and phone calls aren’t likely the best way to keep in touch — especially if you need to keep track of your communication or need to have more face-to-face interactions. Luckily, there are a whole slew of apps that make business communications easier and more effective. Addappt is a great choice for anyone who struggles to keep on top of their contact list. This app allows anyone who uses the app to quickly update their contacts and organize them into groups. Using the app, your employees can message each other — think of all members of a team quickly sending off a message about a meeting — and can even create groups for business contacts. Best of all, Addappt is free for both Apple and Android users. If you are looking to cut down on meetings and internal emails, Slack might be a great choice for your team. This app is an instant message platform that allows you to organize your employees’ conversations into either private or public channels. Team members can send direct messages, share files, and search through past messages and files. The ability to use Slack instead of holding meetings or relying on long internal email chains can lead to increased productivity (as much as 32%, according to a Slack survey). A no-frills version of Slack is available for free, with paid plans starting at just $8 per month. For businesses with virtual or remote employees, Skype is another great option. It is a long-standing web-based platform with an app option that is free for most users (business plans start at just $5 per month). Skype allows users to video conference, instant message, send files and photos and share your computer screen. It works on all devices and operating systems. If Skype isn’t an option for your business, Fuze is another videoconferencing app that can host online meetings for small businesses. It offers high definition video that works on all devices and operating systems, with custom pricing available for small businesses. For some small business owners, a financial app can be a lifesaver, streamlining the payroll, employee benefits, finance or accounting process. While there are a number of finance and accounting apps available for small business, some stand head and shoulders above the rest. QuickBooks has long been known as a leader in the accounting software business. Its app allows users to track your business’ financials via your phone or tablet, upload receipts and other documents via your phone and monitor your statements with your device. The app connects your phone or tablet to the QuickBooks software to give you greater accessibility to your financial statements, with plans costing between $10 to $24 per month for the first six months and then $13 to $40 per month afterwards. It is a free download for anyone who has purchased the QuickBooks software. If you are not a current QuickBooks user, you may want to try the FreshBooks app. Freshbooks allows small business owners to create, manage and track invoices. Through the app, you can automatically bill clients for recurring invoices, accept credit cards on your phone or tablet, track and organize expenses and create custom business reports. The cost of this app ranges from $12.95 per month to $39.95 per month, depending on the size of your business. If you are struggling to manage your payroll, Gusto (formerly known as ZenPayroll) may be a great choice for you. This app will report new hires to the government, and will handle all payroll, tax and benefits deductions and filings for your employees. Gusto files the appropriate paperwork with state, local and federal tax authorities and emails digital pay stubs to employees. The cost for this service is $39 per month, plus $6 for each employee. For small businesses with fewer than nine employees, Wave is an accounting app that can manage your invoices and payments, track sales and expenses, pay employees and generate accounting reports. It is also has a free personal finance software option to help small business owners manage their finances. One of the most challenging aspects of running any small business is staying organized. Handling the paperwork, filings and details of your company can be an overwhelming task. Thankfully, these apps can help you get organized and getting your company on track. For hiring, Proven is the smart way to post across multiple job boards with just one click. Proven also allows you to sort through candidates easily by placing them into yes, no and maybe buckets and to make a notation of when you have followed up with a candidate. The cost to use this service is between $40 and $60 per job listing. The more jobs that you list with Proven, the less it costs per listing. If you create notes on your phone, laptop and other devices, Evernote is a great app to help you sync these notes up across all of your devices and get organized. The free version of the app allows you to sync up to 60 megabytes of data per month, while the Plus version allows up to 1 gigabytes of data for just $34.99 per year. For small business owners that struggle to manage workflow, Trello can help you by allowing you to create “cards” and placing them on various Trello boards. Each card is an assignment or task; members can be added to the cards, along with comments, due dates, and attachments. If you change a card, every member will be notified via email and on their mobile devices. The app is free to use, with the business version costing just $9.99 per month. The business version allows integration with Slack and Evernote so that you can send Trello cards directly via a Slack channel or attach notes to your Trello cards automatically. Making payments can be a drag; writing checks and tracking expenses can take up time, and seems so outdated in 2017. A slew of apps can help you streamline the process. PayPal is an old standby for anyone who has ever shopped online, but it can also be used by small business owners as a portable register. The PayPal app is free, and allows merchants to attach a card reader to a tablet or phone to use it as a portable cash register. PayPal charges a percentage for each transaction based on the type of transaction and whether the business owner has a PayPal Pro plan. As an alternative to PayPal, Square is an app that allows small business owners to attach a portable card reader to their mobile device so that they can process card payments. Square charges 2.75% of each swiped transaction and 3.5% of each manually entered transaction, plus 15 cents. It costs $49 upfront. Larger businesses with over $250,000 in revenue are eligible for custom pricing for Square devices. If your concern is with how to track your expenses, the Expensify app may be a good choice for you. Expensify allows users to link their credit or debit cards to the app so that charges can go directly onto an expense account. Alternatively, you can take a picture of a receipt with your phone, and the pertinent information will automatically be put into an expense report. This is a great app for both business owners and employees who utilize a lot of expense reports. If you find yourself running out of time each day, then a time management app may help you be more productive and be worth every penny of its cost. RescueTime is a great option that provides you with a daily snapshot of how you have spent your time based on your online activity. The Lite version of this app is free, while the premium version — which allows you to block distracting websites and apps — costs $72 per year. This app may not be necessary for everyone, but if you find yourself wasting precious minutes on social media or crushing candy, it could be a great way to get yourself back on track. Clear takes a different approach to time management by making a variety of lists, schedules and reminders for you to complete. It’s easy-to-use format allows you to pull lists down on your phone screen, pinch them and swipe them to mark them as complete. Clear costs $4.99 for Apple devices. If you travel often for business, the TripIt app is a way to put all of your travel plans into one master itinerary that can be accessed through any device. It also allows you to check departure times and delays, view weather reports and even get directions to the airport. The basic TripIt app is free, but the pro version costs $49 per year. An app may not solve all of your business problems, but it can make certain aspects run more smoothly. Choosing the right apps can help you become more productive and efficient as a small business owner — all with just a few clicks.